If you are looking for home insurance you might be confused about all the terminology. This guide will help you learn the language to help you make all the right choices to properly protect your home. Unlike buildings insurance, this is damage caused by you to your home. Some examples are broken glass, door or bathroom damage. This is additional cover not included in basic insurance policies. This is like accidental building damage, but it covers the contents of your home (appliances, furniture, etc…) and any damage you might do to the contents. This is also added cover not included in basic policies. Instead of calculating the rebuilding costs of your home, the coverage amount is based on the number of bedrooms in your home. This is another name for home insurance. This covers a situation where you would need a complete re-build of your house, like in the event of a natural disaster or severe vandalism. The damage covered is damage that is not caused by you. Mortgage lenders will require this type of cover. The amount of cover can be determined by sum insured or bedroom rated methods. This indicates the material that was used to build the walls of your home. It could be concrete, brick, wood or a combination of materials. There’s some information here to help you work out your home’s construction type. This insures all the contents in your home that are not fixed to the property. This is cover against damage not caused by you. The items could include furniture, electronics, appliances, clothing, musical instruments and jewelry. This is where you give your insurance provider the authority to renew your insurance policy every year with no changes in the payment method. Although this makes renewal easy, it’s not the best way to ensure you get a good deal. You’ll get much better value by shopping around for a new policy each year. Use a site like comparethemarket.com to compare policies. Any change in the terms and/or conditions of your home insurance policy. Your total cover might even change. Insurance against flooding might be hard to get in high risk areas. If there are local efforts to reduce flooding, your insurer might be obligated by local government agreement to provide coverage. Find out more about flood coverage at the Environment Agency’s website. If you suddenly have a burst pipe or other emergency, this added cover will pay for a tradesman to come and do repairs. This is applicable to any time of the day, 24 hours. The cash limit is usually around £500. This is the amount you give up on any insurance claim. For example, if your home suffers £300 of damage and your excess is £100, your insurance company will write you a cheque for £200. The higher the excess, the less you get on any claim. However, higher excess also means lower premiums. If someone gets hurt on your property you could get sued for damages. This insurance covers any legal fees in this type of lawsuit. This is a person or party that has a financial interest in your home. In most cases this is a mortgage provider. These are homes or buildings of special historical importance. Lists for your area are available at your local council planning department, or you can search on British Listed Buildings. If you use direct debit, you pay your premium on this day. The total amount you pay for insurance, add-ons, and taxes. This can be paid monthly, bi-monthly, quarterly or annually. The amount you can expect to pay overall for home insurance. You can shop around among different companies and compare quotes. This highlights if your roof is thatched, slate or tile. All other roofs are considered standard. This is damage that can happen to your home due to unstable soil. This can cause parts of your house to sink, and the house walls could begin to crack or ripple. Read more about subsidence in this guide. This calculates cover based on the estimated rebuilding cost of your home. The Association of British Insurers can help you calculate these costs. This amount is not the same as the sale price of your home. This shows all the details of your home insurance policy. It usually contains information like coverage amount, pay dates and endorsements. Your insurance company may also provide information about planned increases in premiums. This is an obligatory government tax and is usually included in any insurance quote price. The bathroom is often the central point of a home, with every member of a household spending plenty of time there. From getting ready for work or a night out to simply unwinding after a long day, a bathroom suite is a key area for the whole family. 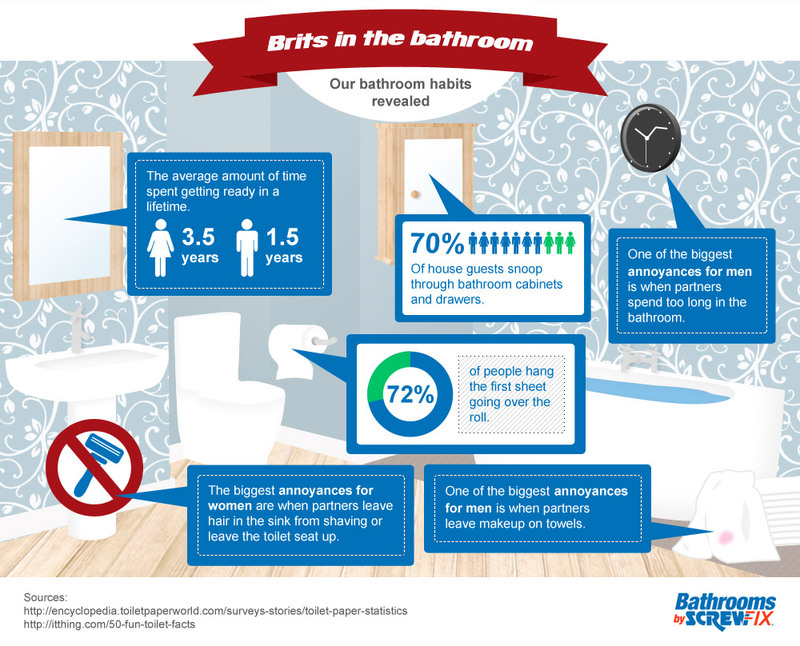 So, how many deadly bathroom sins have you committed? Have the findings made you paranoid about who may be snooping through your cupboards? Some new furniture could be in order to ensure that any attempt to go undercover in your cupboard is unsuccessful. The correct way of hanging toilet paper spared a ferocious debate, with 68 per cent of people admitting that a roll hanging in the opposite way to usual would frustrate them. With so many potential annoyances coming from our actions in the bathroom, redesigning your suite to add a touch of serenity could be the perfect way to avoid bathroom related conflict. Finally, if you were shocked by just how long we spend in our lifetimes getting ready, consider the fact that men spend around 3,000 hours in a lifetime shaving, which is enough time to shear roughly six thousand sheep! Whether you’re looking to sell your home, or simply want to relax in the knowledge that should you come to sell it, you’ll receive a fair price, there is one thing you should be focusing on; the roof. The roof of your home is of the utmost importance; it protects the interior framework from the elements and, with effective insulation, is essential for locking in heat. If you are intending to sell a property, expect potential buyers to quiz you on the state of the roof; this will also be an area of your house which will receive particular attention from the surveyor. For this reason, it’s important that your roof is in tip top condition. A few missing tiles can give the impression that a roof is in a sorry state and is often enough to dissuade buyers from pursuing a property further – even when there’s nothing wrong with the roof structurally. Ensure that all missing tiles are replaced, making sure that you replace them with as good a match as possible. Companies like North East Roofing Supplies have a wide selection of roof tiles, designed for different styles of houses. It’s a good idea to find a supplier that offers this sort of range. After all, a Victorian property with traditional tiles is going look extremely bizarre if the roof is repaired with modern tiles that aren’t in keeping with the design; this the last thing you want when you’re trying to sell a property! The same goes for your guttering. Repair any damaged gutters and replace any that are past saving. Though plastic is a popular choice, it’s worth thinking about alternative materials like metal or fibre glass; though they’re a little more expensive, their durability means that you won’t have to replace them as often. Regular roof maintenance is essential, regardless of whether you’re planning on selling. This is always a relevant issue in the run up to winter, when the threat of bad weather puts extra pressure on you to make sure your roof can take the brunt of the elements. Take a look at our earlier post for preparing your home for winter. The days are getting shorter and cold weather is drawing in; winter is coming. Are you prepared? Winter is one of the toughest times of the year for your home, with adverse conditions potentially leading to a range of costly and troublesome issues. The good news is that with a bit of preparation and some relatively simple improvements, you can ward off the ill-effects of snow, rain and sub-zero temperatures and enjoy a warm and prosperous winter in your home. Windows and doors are the gateways through which most of the heat in your home will escape. Even if you heat your home 24 hours a day at full blast, a single-pane window or a draughty door will allow that heat to escape. Essentially, you’re throwing away money! There are a couple of actions you can take to limit the escape of heat in your home. The easiest and cheapest is to install draught excluders at the bottom of every door in your home; you can pick up draught excluders for relatively cheap at most DIY stores and installing them is as simple screwing the excluder to the bottom of your door. You might need to measure and saw the excluder to size but again, this is quite easy. Most new homes come with double-glazed windows, although older homes will feature single pane windows. If you have the budget, upgrade to double-glazing; the savings you’ll make will far outweigh the initial expense. If you do have double-glazing but still feel a draught, invest in some foam excluder strips. Although they are cheap and won’t last as long as metal excluders, they are easy to install and easy enough to remove in the warm summer months. It is necessary to retain some ventilation in your home, however, so don’t close up absolutely every connection to the outside world. Extractor fans and wall vents help to reduce the level of moisture in your home. Having your windows open for short periods of time (in the middle of the day at the weekend when it’s warmer outside, for example) can also help with reducing damp and mold. Loft and wall insulation are essential for trapping heat that would otherwise escape from your home, although installing this kind of insulation is a lot more difficult and expensive. The best way to determine whether your home has loft and wall insulation to call an expert to conduct a survey of your home although there are a couple of other tell tale signs, such as small drill holes on the outer wall of your home. The installation of loft and wall insulation is a job best left to a professional, although the costs of doing calling in an expert will be more than justified by the savings you make in the long run. A lot of people only think about the inside of their home when undertaking winter improvements, but the effects of winter on the outside of your home can lead to just as much adversity. One area that can be particularly troublesome is the gutters. Gutters are susceptible to blockages from fallen leaves; these blockages lead to water becoming trapped and pooling. In sub-zero temperatures, this pooled water freezes and this can lead to the gutter cracking. As such, it’s important to check that your gutters aren’t blocked on a regular basis. Installing a leaf guard is also a good idea, as it reduces the amount of time you have to spend cleaning! A broken boiler is one of the worst things that can happen in winter, leaving you without hot water and heating. The cost of repairing a boiler can also make a serious dent in your bank account! * Making sure that your boiler servicing is up to date. * Insulating the condensate pipe with lagging. * Checking the pressure of your boiler. You should also run your heating on a regular basis to ensure that the boiler’s pipework doesn’t freeze up and crack. If you’re unsure about the operation of your boiler, call in an expert to help. Winter can be an arduous time for a homeowner, but as demonstrated in this post, preparing for winter doesn’t take too much time or cost too much money. Be prepared, and you should enjoy a trouble-free winter. Christopher Smith is writing on behalf of Excel Compressors, who sell a large range of used air compressors for DIY purposes.